Title: If An Eye Offend Thee! Synopsis: "Must I slay my own son, mine only son -- to decide the destiny of accursed Midgard?" 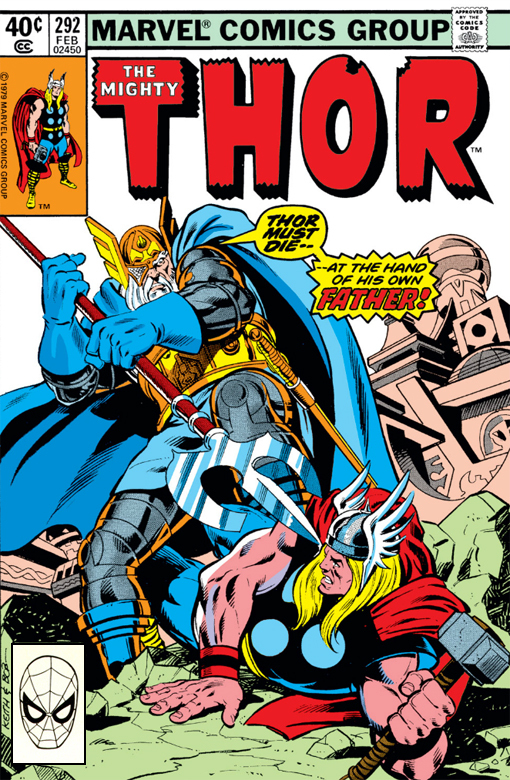 Odin asks as he holds his enchanted spear Gungnir to Thor's throat. The All Father agonizes over a thousand year-old promise he made to the Celestials over his love for his son. Odin also makes a cryptic reference to having killed his son once before, deciding that he will have no further part in this conflict and bidding Zeus farewell as he returns to Asgard. Zeus says that the fight need not continue since the peril they were seeking to prevent affects only the fate of Earth, which is of no great concern to the Gods. Zeus says that he only agreed to fight the Eternals out of spite and old resentment for the godlings, but that they have no real quarrel, so they leave citizens of Olympia to fend for themselves against the 50 Year Judgement of the Celestials. Zuras tells Thor that the Eternals will go their own way to attempt to save Earth, so the Odinson considers his own strategy, recalling the words his father spoke about his missing eye.Thor believes that Odin's words were a clue that his missing eye could provide the knowledge that the Thunder God needs to defeat the Celestials. Departing Olympia via his enchanted hammer Mjolnir, Thor finds that Odin's eye has become a monster that torments a world, engaging the disembodied creature in combat. Thor eventually triumphs over Odin's eye and the issue closes with the promise from the eye of revelations that will leave the Thunder God never the same again. To be continued next issues in Cycles and Space Gods!